As a company full of driven, socially conscious individuals, we believe and understand the importance of committing ourselves to the community. 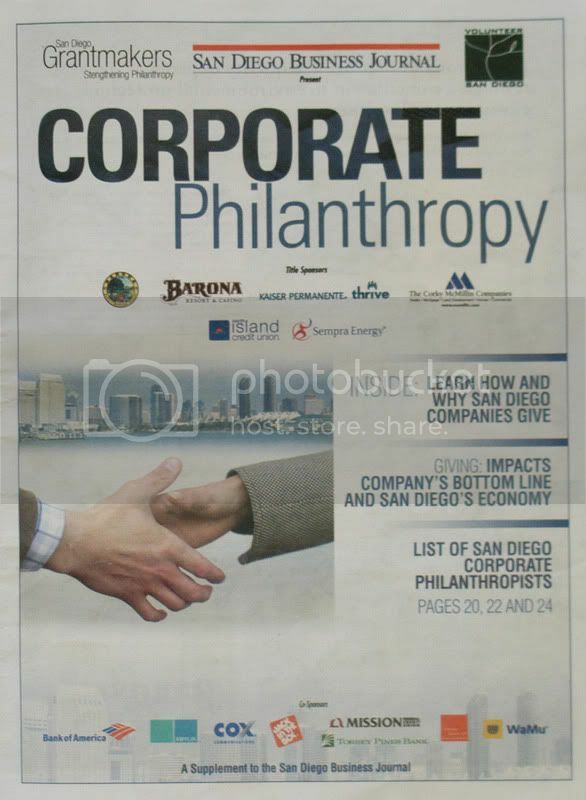 Thatâ€™s why we were super thrilled to find out that DT was featured, along with other reputable San Diego businesses, in the San Diego Business Journal – Corporate Philanthropy section this past month. The article highlighted various San Diego companies and the countless number of volunteer, charity hours and donations of those companies. Volunteering not only leaves you feeling warm and fuzzy on the inside, but itâ€™s fun and fulfilling. As part of a company effort to stay focused on our philanthropy efforts, we are allotted 2 hours every month on company time to volunteer. DT recognizes the importance of flexibility which is essential in all of our charity endeavors. Itâ€™s this mindset and guiding principle that lead us to be highlighted on the San Diego Business Journalâ€™s Corporate Philanthropy list! So great job to the DT team because without your continuous philanthropic efforts we would never have made it on the list! And thank you to the San Diego Business Journal for recognizing the amazing hard work and dedication San Diego businesses put back into the community each and every day. For your convenience, we have included the entire story below. Enjoy! Q: What is your companyâ€™s giving philosophy? A: At digital-telepathy, we constantly strive to do business in a way that enriches our community and makes the planet a better place in which to live. Itâ€™s not that weâ€™re trying to be all goody-goody, it is just who we are. And it is the key to achieving our triple bottom line: Bring profitability to our people, our planet, and only then to our pocketbooks. Q: Why does your corporation give? A: The joy of working for a socially conscious company is that you do not have to check your morals at the door. The joy of volunteering your time and talents to those less fortunate is something that canâ€™t be measured. We give because we want to. We give because it is a part of each of us as individuals, and brought together, what makes our company such a great place to work and San Diego such a great place to live. Q: What are your companyâ€™s giving areas and why? A: dt is a melting pot of many personalities, and all of us have varied interests and ideas when it comes to philanthropy. Some of us bike to work to lower carbon emissions, some of us teach handicapped kids how to horseback ride, some of us answer phones during KBPS telethons, and all of us get together to clean up Pacific Beach for Earth Day. We donâ€™t just talk the talk; we prefer to walk the walk. And that means getting out into the community to do our part. Q: What type of philanthropy does your company engage in (cash, in kind, volunteerism, etc)? A: At dt, we are a passionate bunch. As a group of fun, out-going individuals, we love to lend our talents to any and all local projects that can enrich our personal selves and our community. Anybody can write a check to an organization in need. We prefer to participate in volunteer events because we have so many talents to share…and because itâ€™s just plain fun to get out of the office to take an active role in the world around us. Q: How does the company fund donations (foundation, donor advised fund, community relations, HR, etc.)? A: Our donation funds come from dtâ€™s net profits and countless hours of donated time. Oh, and we canâ€™t forget pro bono Web development services. Q: How does the company involve employees in volunteerism and giving? A: Our company does not involve our employees in volunteerism, but rather our employees actively involve the company. dt Do Gooders is an employee-run initiative that began because a couple of dt folks recognized that busy employees need help getting involved. By using San Diego-based website Eventful.com, dt Do Goodersâ€™ calendar of events is now accessible to the entire San Diego community. You too can come on out and join us at our next volunteer activity! But how do our employees have the necessary time to log some serious volunteer hours? Because our boss gives us time off to do so! Everyone at dt is encouraged to take 2 hours per month to get our hands dirty in the community. At the end of each quarter, the employee with the most volunteer hours is eligible for a donation to his/her charity of choice. And weâ€™ll soon have a widget on our website so that people can track our progress. Q: What advice would you give companies considering starting a volunteerism or corporate giving program? A: First, allow your employees the flexibility they need to volunteer. Stressed out people arenâ€™t good for your business, nor are they helpful to a community in need. Second, foster passion in your employees. Let them each discover a cause that is the right fit for their personality and their schedule. Then simply give them opportunities to delight in that cause and watch the magic happen. Q: Describe a major philanthropic success your company has achieved?